Skerryvore kicked off 2018 with an astounding performance in front of 12,000 revelers at Inverness Hogmanay celebrations. The year was yet another whirlwind of live events, but also interspersed with preparatory work for EVO, their latest album, released on June 11. Described as “The sound of Young Scots Power Folk” (Mark Radcliff, BBC Radio 2), the band — brothers Daniel Gillespie (accordion) and Martin Gillespie (whistles and accordion), Fraser West (drums and vocals), Alec Dalglish (lead vocals and guitar), Craig Espie (fiddles), Alan Scobie (keyboards), Jodie Bremaneson (bass) and recent addition Scott Wood (bagpipes) — tour extensively, not only throughout Scotland and the rest of the U.K., but also worldwide. 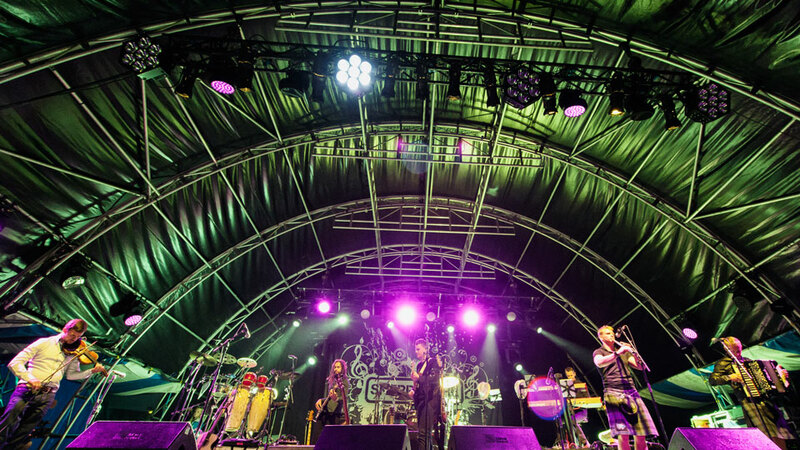 To celebrate Skerryvore's 10th anniversary in 2015, the band organized a festival and played a sell-out 6,000-capacity concert at Mossfield Stadium, Oban. An album, Decade, was also released, and the festival launched a world tour to Holland, Germany, Switzerland, Italy, Denmark and the USA, as well as U.K. gigs stretching from Shetland to the South of England. Skerryvore returned to the U.S. in August 2016 for a seven-week, coast-to-coast tour, their longest yet. Then in 2017, they signed with U.S. agents SRO and enjoyed two U.S. tours — a festivals tour and a theaters tour — and by Easter had already completed two of multiple transatlantic trips in 2018. All members bring their own musical style to the Skerryvore mix. The more they have experimented with this mix, the more the band and its signature sound have evolved. This is evident in the progression across the six albums released since 2005. Skerryvore's latest 11-track album, EVO, is a mix of songs and tunes that typically migrate from “big blast” numbers to heartfelt, reflective tracks. It includes the previously released single “Live Forever” and their latest release, “Take My Hand.” A video for “Take My Hand” was released in May 2018. Following up on the sell-out success of their 2015 Decade event, Skerryvore’s “Oban Live” festival launched as a two-day event in May 2016 and is now fully established on the Scottish Music Festivals calendar; the third installment was in June 2018.